It's so easy to get busy and make excuses to not do your workout or to eat an extra serving of mashed potatoes and think "it doesn't matter," but IT DOES! 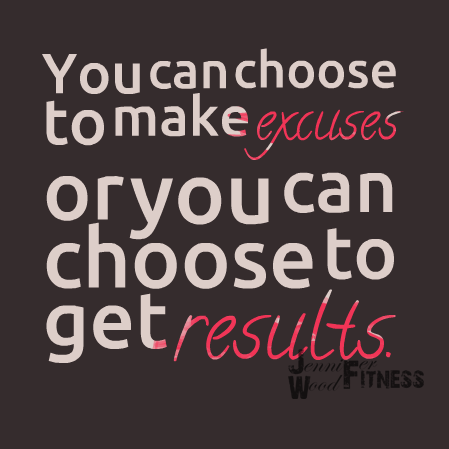 Take a step back and reexamine your goals and look at your excuses. Are they lining up with your goals or keeping you from reaching them. Are you sabotaging all your hard work for these small moments of pleasure. Now, I am not saying to never have a treat meal, but a treat meal should be just that - a treat meal within moderation, NOT an all day buffet feast. Each time you make a healthy choice and do your workout when you don't FEEL like it brings you a little closer to your goal. So, today, make a conscience effort to make better choices and do the things you know will help you instead of tear you down. Surround yourself with positive people who have the same fitness and weight loss goals as you. People who will lift you higher when you slip up and encourage you to keep going when you want to quit. A support system is key when you are trying to lose weight and live a healthier lifestyle.